In order to realize full and equal access to and participation of women and girls in science, and further achieve gender equality and the empowerment of women and girls, the United Nations General Assembly adopted resolution A/RES/70/212 declaring 11 February the International Day of Women and Girls in Science. Tomas Danicek, international UN Volunteer for ICT in Education with UNESCO in Ethiopia, facilitating a leadership training for other UN Volunteers. Spearheaded by the United Nations Educational, Scientific and Cultural Organization (UNESCO), SDG 4 aims to ‘Ensure inclusive and equitable quality education and promote lifelong learning opportunities for all’. The Education 2030 agenda also emphasizes that ‘girls and boys, women and men not only gain access to and complete education cycles but are empowered equally in and through education.’ However, large gender gaps exist in access, most often at the expense of girls. According to UNESCO’s Institute for Statistics, 16 million girls will never set foot in a classroom, and women account for two thirds of the 750 million adults without basic literacy skills. The good news is that, in the past decade, the enrolment rate of girls of all ages has been catching up to that of boys. Sub-Saharan Africa has seen the greatest gains. At the primary level, girls’ enrolment has risen more than 50 percentage points since 1970, compared to about 30 percentage points globally. However, education for girls is not just about enrolment. It is also about career paths that determine future incomes. Despite increasing enrolments for girls, still fewer girls chose career paths in Science, Technology, Engineering, and Mathematics (STEM). Many girls are deterred from entering the STEM workforce due to outdated stereotypes that still exist today. Indeed, research shows that, upon reaching high school, 40 per cent of girls simply assume that jobs specifically requiring coding and programming are just “not for them”. At college, that percentage jumps to a staggering 58 per cent (Microsoft, 2018). The stark gender divide in the science, technology, engineering and mathematics (STEM) fields is evident from the earliest days of a child’s schooling through to higher education and the working world. It is an untenable situation, not only limiting the aspirations of girls and women, but also serving as a direct obstacle to the achievement of the 2030 Agenda for Sustainable Development. 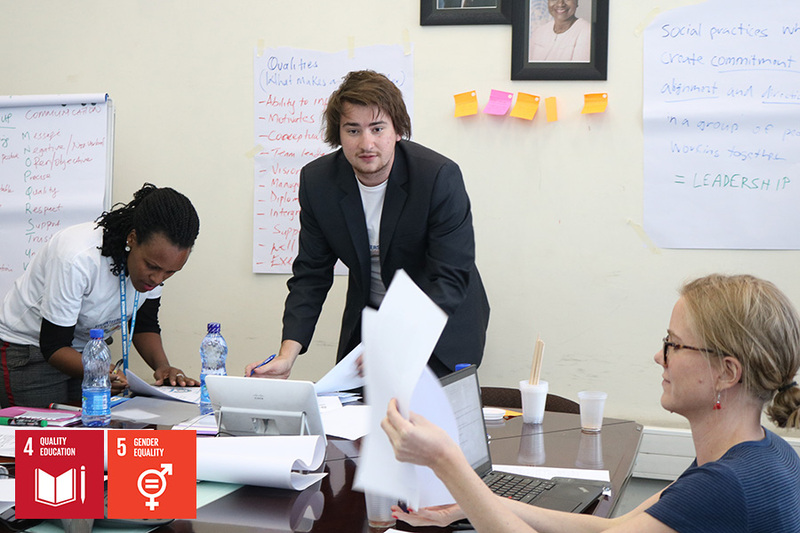 Tomas Danicek, a UN Volunteer from the Czech Republic serving with the UNESCO International Institute for Capacity Building in Africa (UNESCO-IICBA) in Ethiopia, is working to reverse these trends all across Africa through gender-responsive e-content development. Tomas is also creating a pool of women who have been successful in STEM career paths to act as role models for young women struggling with career choices. Tomas joined hands with his colleagues, Next Einstein Forum, UN Women and multiple initiatives from Ethiopia to promote increased enrolment of girls in STEM through organizing mentorship and networking activities and presenting in several education forums. In November 2018, he designed and ran a workshop on Gender-responsive STEM Teaching and E-Content Development at the Regional Conference for Mathematics, Science and Technology Education in Africa (COMSTEDA 16) in Mau, Botswana. As part of Next Einstein Forum’s Africa Science Week for Ethiopia celebration in December 2018, Tomas coordinated and moderated a Science and Technology Cocktail, attended by four foremost Ethiopian female scientists and groups of high school and university girls who have developed innovative mobile and web applications to help the visually impaired to text and call, find medicine and access studying materials. Around 30 high school students, both girls and boys, were in the attendance to be inspired and extra motivated to break through in different STEM fields. Tomas hopes that through delivering events such as these annually, he can help alter the mindsets of teachers and teacher educators to encourage greater participation of girls in STEM and ultimately strengthen their position on the job market and subsequently their presence in respective scientific and technological fields.